Behçet's disease is a multisystem disease in which there is evidence of immunological dysregulation. It has been proposed that γ/δ T cells are involved in its pathogenesis. The aim of the present study was to assess the capacity of γ/δ T cells with phenotype Vγ9/Vδ2, from a group of Italian patients with Behçet's disease, to proliferate in the presence of various phosphoantigens and to express tumour necrosis factor (TNF) and IL-12 receptors. Twenty-five patients and 45 healthy individuals were studied. Vγ9/Vδ2 T cells were analyzed by fluorescence activated cell sorting, utilizing specific monoclonal antibodies. For the expansion of Vγ9/Vδ2 T cells, lymphocytes were cultured in the presence of various phosphoantigens. The expression of TNF receptor II and IL-12 receptor β1 was evaluated with the simultaneous use of anti-TNF receptor II phycoerythrin-labelled (PE) or anti-IL-12 receptor β1 PE and anti-Vδ2 T-cell receptor fluorescein isothiocyanate. There was a certain hierarchy in the response of Vγ9/Vδ2 T cells toward the different phosphoantigens, with the highest expansion factor obtained with dimethylallyl pyrophosphate and the lowest with xylose 1P. The expansion factor was fivefold greater in patients with active disease than in those with inactive disease or in control individuals. TNF receptor II and IL-12 receptor β1 expressions were increased in both patients and control individuals. The proportion of Vγ9/Vδ2 T cells bearing these receptors was raised in active disease when Vγ9/Vδ2 T cells were cultured in the presence of dimethylallyl pyrophosphate. These results indicate that Vγ9/Vδ2 T cell activation is correlated with disease progression and probably involved in the pathogenesis. Behçet's disease is a multisystem disorder that is characterized by oral and genital ulcers, and mucocutaneous, ocular, joint, vascular and central nervous system involvement. It is particularly frequent in countries along the Silk Route, from the Mediterranean area to Japan, and is strongly associated with HLA-B51 . Various micro-organisms such as streptococci and herpes simplex virus have been implicated in the pathogenesis of Behçet's disease. There is also evidence of immunological dysregulation, including neutrophil hyperfunction, autoimmune manifestations, and several phenotypic and functional lymphocyte abnormalities, possibly resulting from complex interactions of genetic and environmental factors [2–6]. Histological findings in Behçet's disease suggest a mixed or mainly mononuclear cell infiltration with a predominance of T cells in the inflammatory infiltrates of oral ulcers, erythema nodosum-like lesions and pathergy reactions [7, 8]. Increases in γ/δ T cells in peripheral blood and cerebrospinal fluid, and heightened γ/δ T cell responses to heat shock protein derived peptides suggest a role for this T-cell subset in the aetiopathogenesis of Behçet's disease . γ/δ T cells play a prominent role in immune regulation; they are the first line of host defence and control epithelial cell growth, thus participating in the maintenance of epithelial integrity [10, 11]. In particular, it has been postulated that they recognize structures presented by microorganism as well as by stressed, abnormal cells, preventing the entrance of pathogens into the subepithelial layer by a cytotoxic mechanism against infected and stressed epithelial cells . Some populations of these cells are known to be involved in the initiation of acute inflammatory responses and in the persistence of chronic inflammation in several skin diseases . Finally, γ/δ T cells have been reported to produce several cytokines, with the cytokine profile dependent on the nature of the immune response. They also produce a panel of chemokines that may attract inflammatory cells within damaged epithelium . On the basis of these observations, it has been hypothesized that γ/δ T cells may trigger the development of Behçet's disease [9, 15–17]. In the present study we analyzed γ/δ T lymphocytes with phenotype Vγ9/Vδ2 in Italian patients with active and inactive Behçet's disease. Among γ/δ T cells, Vγ9/Vδ2 T cells represent the majority peripheral blood T cells in healthy individuals . The response of Vγ9/Vδ2 cells to phosphoantigens was investigated. Because of their relatively low number, circulating Vγ9/Vδ2 T cells must be specifically activated by nonpeptidic phosphorylated antigens (so-called phosphoantigens) . Subsequent to this stimulation by nonpeptidic ligands, Vγ9/Vδ2 T cells proliferate, release type 1 cytokines and acquire cytotoxic activity against tumour cells  or virus infected cells . It has been shown that tumour necrosis factor (TNF)-α and IL-12 induce activation and proliferation of γ/δ T cells in vitro . 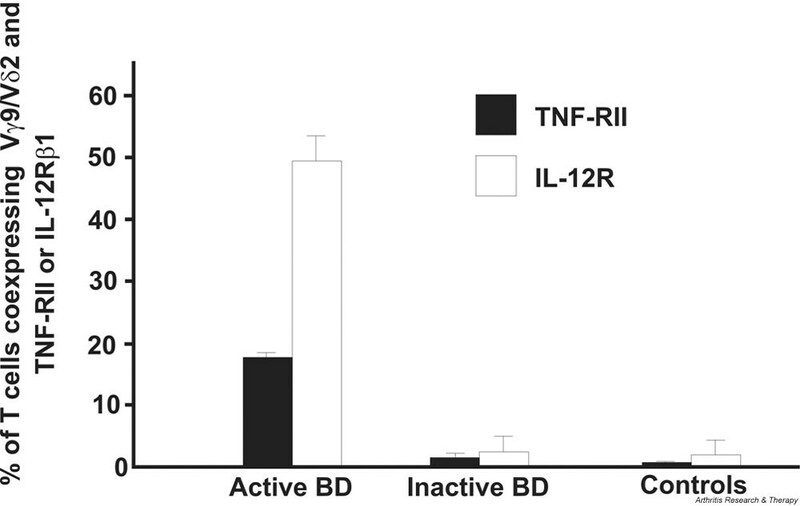 Plasma levels of TNF-α and IL-12 have been also found to be increased in Behçet's disease . In this regard, we examined the expression of TNF-α and IL-12 receptors on Vγ9/Vδ2 T cells before and after inducing their expansion. Twenty-five patients with Behçet's disease (12 males and 13 females, mean age 42 ± 24 years), classified according to the International Study Group for Behçet's disease , were studied. The activity of Behçet's disease was assessed by the 1994 criteria for disease activity of Behçet's disease, proposed by the Behçet's Disease Research Committee of Japan . At time of sampling, disease was active in 15 patients and inactive in 10. All patients were using colchicine, an immunosuppressant agent such as ciclosporin (n = 8), azathioprine (n = 2) and low dose corticosteroids (n = 16). Forty-five healthy volunteers (age range 21–47 years, mean 38 years) were enrolled as controls. Human studies committee approval and individual informed consent from each patient were obtained. mAbs specific for human surface antigens anti-CD3 phycoerythrin-labelled (PE) and anti-T-cell receptor (TCR) Vδ2 fluorescein isothiocyanate (FITC; PharMigen, San Diego, CA, USA) were used as follows. Peripheral blood mononuclear cells (PBMCs; 106 in 100 μl phosphate buffered saline [PBS] with 1% heat-inactivated foetal calf serum and 0.02% Na-azide) were incubated at 4°C for 30 min with anti-CD3-PE conjugated mAb and anti-TCR Vδ2 FITC conjugated mAb simultaneously. After washing, the cells were suspended in PBS with 1% foetal calf serum and analyzed on a FACScan flow cytometer (Becton Dickinson, Mountain View, CA, USA) by using forward scatter/side scatter gating to select the lymphocyte population for analysis. PBMCs were obtained from each individual by separating heparinized venous blood on Ficoll (Euroclone, Wetherby, Yorkshire, UK). The cells were washed in RPMI-1640 medium (Euroclone), and cultured in 24-well plates (Costar, Cambridge, MA, USA) at a concentration of 5 × 105 cells/ml in RPMI 1640 supplemented with 10% foetal calf serum (Euroclone), hepes 20 mmol/l (Euro-clone), 2 mmol/l L-glutamine (Euroclone) and penicillin/streptomycin 100 U/ml (Sigma, St Louis, USA), at 37°C and at 0.5% CO2. For the expansion of Vγ9/Vδ2 T cells, PBMCs were cultured for 10 days in medium alone or in the presence of the follow phosphoantigens: xylose 1-P (Sigma; 0.5 mmol/l final concentration); ribose 1-P (Sigma; 0.5 mmol/l final concentration); dimethylallyl pyrophosphate (DMAPP; Sigma; 0.5 mmol/l final concentration); isopentenyl pyrophosphate (Sigma; 0.5 mmol/l final concentration); or Mycobacterium tuberculosis derived TUBAg (1 nmol/l final concentration; generously provided by Dr JJ Fourniè, CHU Purpan, Toulouse, France). After 72 hours, cultures were supplemented with a 0.5 ml medium containing 20 U/ml recombinant human interleukin (IL-2; Genzyme, Cambridge, MA, USA). Every 72 hours, 0.5 medium was replaced with a 0.5 ml fresh medium containing 20 U/ml IL-2. After 10 days, cells were washed three times in medium, and expansion of Vγ9/Vδ2 T cells was assessed using FACScan, as described above. The absolute number of Vγ9/Vδ2 T cells in each culture was calculated according to the following formula: %Vγ9/Vδ2 positive cells before culture × total cell count/100. The Vγ9/Vδ2 expansion factor (EF) was then calculated by dividing the absolute number of Vγ9/Vδ2 T cells in specifically stimulated cultures by the absolute number of Vγ9/Vδ2 T cells cultured in the absence of any antigen . We studied the expression of TNF receptor II and IL-12 receptor β1 on Vγ9/Vδ2 T cells from peripheral blood of patients with Behçet's disease and from normal individuals, using anti-TNF receptor II PE or anti-IL-12 receptor β1 PE mAbs (R&D systems, Minneapolis, MN, USA) and anti-Vδ2 TCR FITC simultaneously. We also evaluated the expression of these receptors after stimulation of Vγ9/Vδ2 cells with phosphoantigens with and without the addition of exogenous human TNF-α (10 ng/ml = 100 U/ml Genzyme) for 10 days. Briefly, cell cultures were centrifuged at 500 g for 5 min and washed three times in an isotonic PBS buffer supplemented with 0.5% bovine serum albumin, to remove any residual growth factor that might have been present in the culture medium. Cells were then resuspended in the same buffer to a final concentration of 2 × 106 cells/ml, and 100 μl of cells were transferred to a 5 ml tube for staining with anti-TNF receptor II and anti-IL-12 receptor (10 μl/105 cells) and anti-Vδ2 (1 μl/106 cells). After incubation for 30 min at 4°C and two washings, the cells were resuspended in 500 μl PBS buffer for flow cytometric analysis. As a control, cells were treated in a separated tube with phycoerythrin-labelled mouse IgG antibody (Sigma). Student's t-test was used to compare responses in different groups. P < 0.05 was chosen for rejection of the null hypothesis. The percentage of δγT cells with phenotype Vγ9/Vδ2 was similar in both patients and normal individuals (2.38 ± 1.56% and 3.05 ± 1.34%, respectively). There was no statistical difference in the percentage of Vγ9/Vδ2 T cells between patients with active (2.63 ± 1.73%) and those with inactive (2.02 ± 1.26%) disease. The number of circulating Vγ9/Vδ2 T cells also was not substantially modified by different therapies. The expansion of Vγ9/Vδ2 T lymphocytes was evaluated in vitro by incubating the cells with five different phosphoantigens for 10 days or in medium (containing IL-2) alone. At this time the percentage of expansion was assessed by fluorescence activated cell sorting (FACS) analysis using the anti-TCR Vδ2 mAb. The results were expressed as EF (see Materials and methods). 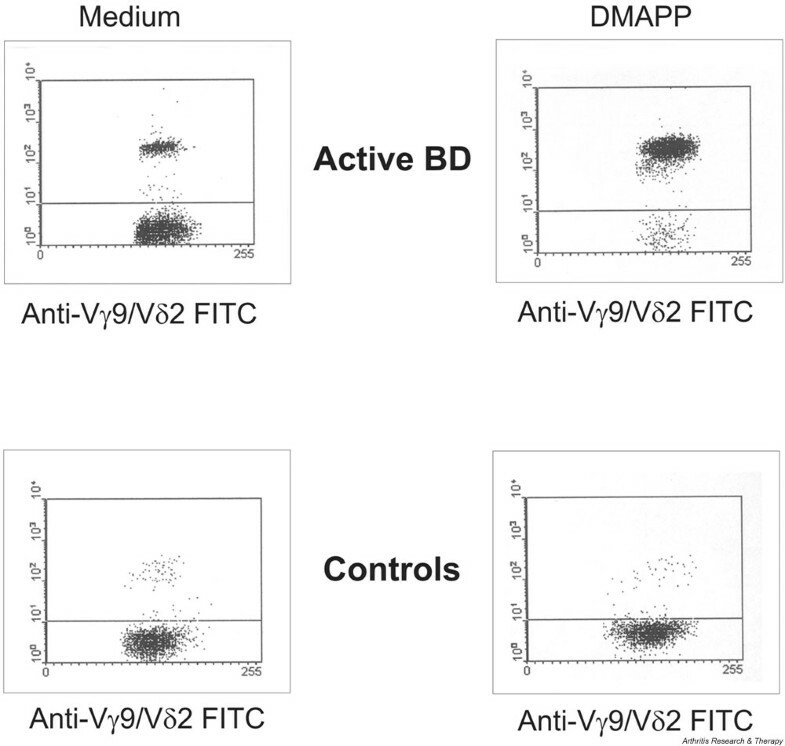 There was a certain hierarchy in the response of Vγ9/Vδ2 cells toward different phosphoantigens, with the highest EF obtained with DMAPP and the lowest with xylose 1P (Fig. 1). A significant difference was found in the response to DMAPP in the tested groups. Specifically, the EF of Vγ9/Vδ2 cells of patients with Behçet's disease was fourfold higher than that in healthy control individuals (113.4 ± 153 and 28.5 ± 22.5, respectively). In addition, the EF of Vγ9/Vδ2 T cells from patients with active Behçet's disease was fivefold higher than that of cells from patients with inactive disease (170 ± 180 and 34.1 ± 30.6, respectively). Fig. 2 shows a typical cytofluorometric analysis of expansion of Vγ9/Vδ2 cells from one patient with Behçet's disease and one healthy control individual on stimulation with DMAPP. Expansion of Vγ9/Vδ2 T lymphocytes from patients with active or inactive Behçet's disease and healthy control individuals in response to various phosphoantigens. The Vγ9/Vδ2 expansion factor (EF) was then calculated by dividing the absolute number of Vγ9/Vδ2 T cells in specifically stimulated cultures by the absolute number of Vγ9/Vδ2 T cells cultured in the absence of any antigen. DMAPP, dimethylallyl pyrophosphate; IPP, isopentenyl pyrophosphate; RIB, ribose 1-P; TUBAg, Mycobacterium tuberculosis related phosphorylated components; XYL, xylose 1-P.
Cytofluorimetric analysis of Vγ9/Vδ2 T lymphocytes from a patient with active Behçet's disease (BD) and a healthy control individual in vitro, cultured with dimethylallyl pyrophosphate (DMAPP) or medium alone. The horizontal axis represents log10 fluorescence intensity of Vγ9/Vδ2 stained cells. Each analysis was repeated at least three times and was performed each time with cells from different donors. FITC, fluorescein isothiocyanate. We investigated the expression of TNF receptor II and IL-12 receptor β1, as cell activation markers, in the Vγ9/Vδ2 T cell population from Behçet's disease patients (n = 8) and from normal control individuals (n = 4; Fig. 3). The expression of these receptors was analyzed in Vγ9/Vδ2 T cells of peripheral blood and in cells cultured in the presence of DMAPP with or without the addition of exogenous TNF-α. No difference was observed in the occurrence of surface TNF-α and IL-12 receptors on resting Vγ9/Vδ2 T cells from all studied groups. This finding is reinforced by the knowledge that these receptors are not constitutively expressed on γ/δ T cells. 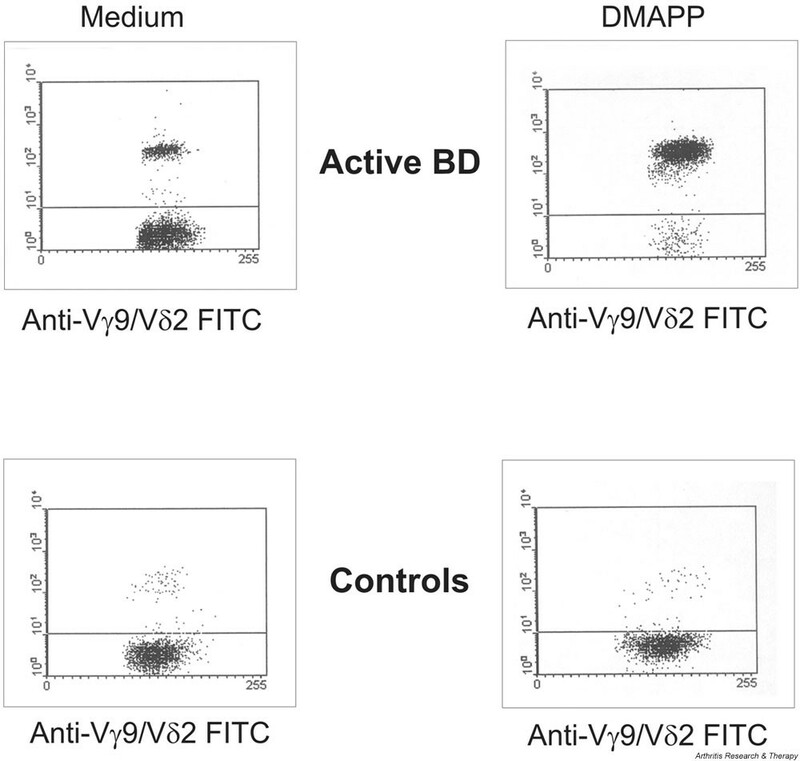 TNF receptor II and IL-12 receptor β1 were detected on Vγ9/Vδ2 T lymphocytes after the addition of DMAPP or DMAPP plus TNF-α. 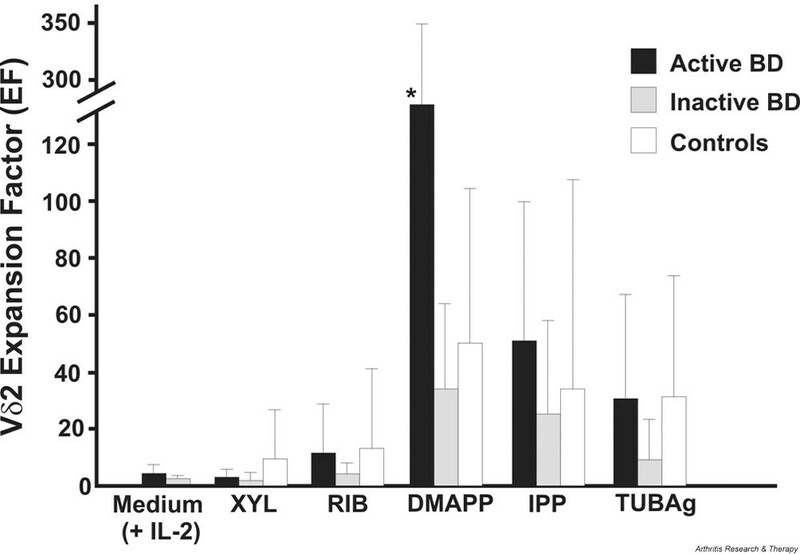 TNF receptor II and IL-12 receptor β1 expression was increased after 10 days in all studied groups. In particular, the proportion of cells coexpressing Vγ9/Vδ2 and TNF receptor II or IL-12 receptor β1 was higher among patients with active disease (n = 4; 17.8 ± 1.1% and 49.2 ± 5.5%, respectively) than in patients with inactive disease (n = 4; 1.4 ± 0.9% and 25.2 ± 2.2%, respectively) or control individuals (n = 4; 0.5 ± 0.4% and 1.6 ± 2.2%, respectively). When Vγ9/Vδ2 cells from patients with active Behçet's disease were cultured in the presence of TNF-α there was a further increase in the cells coexpressing Vγ9/Vδ2 and TNF receptor II (24 ± 5.6% in active Behçet's disease; 0.65 ± 0.2% in inactive Behçet's disease; 1.26 ± 1.02% in control individuals). Fig. 4 shows a typical cytofluorimetric analysis of TNF receptor II and IL-12 receptor β1 positive Vγ9/Vδ2 T cells. Expression of tumour necrosis factor receptor II (TNF-RII) and IL-12 receptor β1 (IL-12Rβ1) on Vγ9/Vδ2 T lymphocytes from patients with active or inactive Behçet's disease (BD) and healthy control individuals. Results are expressed as percentage of Vγ9/Vδ2 T cells. Tumour necrosis factor receptor II (TNF-RII) and IL-12 receptor β1 (IL-12Rβ1) expression of Vγ9/Vδ2 T lymphocytes from a patient with active Behçet's disease (BD). The ordinate indicates the expression of phycoerythrin-labelled (PE) conjugated TNF-RII or IL-12Rβ1, and the abscissa indicates the expression of fluorescein isothiocyanate (FITC)-conjugated anti-Vγ9/Vδ2. Each analysis was repeated at least three times and was performed each time with cells from different patients. DMAPP, dimethylallyl pyrophosphate. The immunopathogenesis of Behçet's disease is believed to be T-cell mediated. Oligoclonal expansion in CD4+ and CD8+ T-cell subsets were observed in clinically active Behçet's disease . However, γ/δ T lymphocytes appear to play an important role in the development of disease [9, 15–17]. γ/δ T lymphocytes play a major role in mucosal immunity and in the first line of host defence [10, 11]. The preferential localization of γ/δ T cells in epithelial layers was also considered evidence for their surveillance function at these important sites of microbial entry . In addition, they may regulate the function of αβ T cells through the production of cytokines . Associations with disease have been also reported for rheumatoid arthritis , autoimmune thyroid conditions , autoimmune liver disease  and multiple sclerosis . Increased levels of γ/δ T cells have been demonstrated in Behçet's disease [9, 15–17], and a role in the pathogenesis of the disease has been also suggested. In the present study we analyzed the in vitro expansion capacity, and TNF receptor II and IL-12 receptor β1 expression of Vγ9/Vδ2 T cells, which represent the majority of γ/δ T lymphocytes in the peripheral blood , after exposure to phosphoantigens. In fact, phosphoantigens are known to activate specifically Vγ9/Vδ2 T cells in a major histocompatibility complex unrestricted, but TCR-dependent manner . A low number of circulating Vγ9/Vδ2 cells was found both in patients with active and in those with inactive Behçet's disease, and this was comparable with the number in normal control individuals. Different results have previously been reported, but this discrepancy is probably due to inclusion of different populations of patients and/or stages of disease progression in those studies . Indeed, Vγ9/Vδ2 cells from patients with active Behçet's disease, but not from inactive patients or control individuals, responded to DMAPP in vitro with expansion and upregulation of TNF receptor II and IL-12 receptor β1 expression. This phenomenon might be explained by the fact that Vγ9/Vδ2 cells from active patients are pre-activated in vivo. In vivo activation of Vγ9/Vδ2 lymphocytes may be the result of the presence of cytokines (i.e. TNF-α and IL-12) . Moreover, increased serum levels of proinflammatory cytokines, namely IL-1β, IL-6, TNF-α [34, 35] and IL-12 , have been found in active Behçet's disease. Alternatively, Vγ9/Vδ2 T cells in active disease might be less susceptible to apoptosis and account for the increased expansion. Indeed, our recent results in unfractionated T lymphocytes from patients with active Behçet's disease, which show inhibition of spontaneous and CD95-induced apoptosis after exposure to IL-12 (unpublished data), might be in agreement with this hypothesis. In the present study we found that peripheral Vγ9/Vδ2 lymphocytes from active patients do not express TNF and/or IL-12 receptors. However, enhanced expression of other activation receptors (IL-2 receptor β, HLA-DR, CD29 and CD69 antigens) have been reported in unstimulated γ/δ T lymphocytes from patients with active Behçet's disease [15, 32], this discrepancy probably being due to the fact that our cytofluorimetric analysis is not sensitive enough to measure membrane antigens in a relatively low number of cells. After phosphoantigen stimulation a remarkable upregulation of TNF receptor II and IL-12-receptor β1 expression was observed, the expression being maximal in the presence of TNF-α. Cell TNF receptor II and IL-12 receptor β1 expression was not investigated in Vγ9/Vδ2 T cells from Behçet's disease patients. Increased serum levels of soluble TNF receptor II has been observed, however, during the active stage of disease , and a central role of IL-12 in the pathogenesis of Behçet's disease has been postulated . A possible role played by TNF receptor II could be to increase the local concentration of TNF-α, which would in turn promote TNF-receptor I engagement, with both TNF receptors II and I being directly involved in cytotoxic activity . TNF-α, which has been reported also to be produced by γ/δ T cells , hence might stimulate the TNF receptor bearing γ/δ T cells in an autocrine or paracrine manner or both, to express CD25, proliferate and upregulate IL-12 receptor expression. It is also possible that the ability of IL-12 and TNF-α to upregulate mutual receptors may lead to a reciprocal amplification circuit in γ/δ T cells . All together, these data clearly indicate that Vγ9/Vδ2 T lymphocytes from patients with Behçet's disease are activated. Vγ9/Vδ2 T cells may play a key role in the pathogenesis and progression of Behçet's disease. They may be responsible for the development of inflammatory processes through cytokine production and subsequent induction of adhesion molecules, which permit accumulation of reactive T lymphocytes at the sites of inflammation. In this regard, involvement of γ/δ T cells in the local injury process has been also demonstrated by their presence in the infiltrate of mucosal ulcerations . Further definition and identification of effector functions of the Vγ9/Vδ2 cells are required to prove their role in the maintenance of disease. In addition, inhibition of γ/δ activation, and therefore of proinflammatory cytokine production, may provide an interesting therapeutic strategy for novel treatments for Behçet's disease. This work was supported by a grant from Ministero della Istruzione, della Università e della Ricerca (MIUR) of Italy. Dr A Accardo-Palumbo is a PhD student and recipient of a fellowship from MIUR. This work was presented at the Annual European Congress of Rheumatology (Prague, 13–16 June 2001) and was published in abstract form in the Annals of the Rheumatic Diseases (volume 60, supplement 1, page 193). GT and AA-P have contributed equally to this work. The authors wish to thank Dr JJ Fournie (CHU Purpan, Toulouse, France) for providing TUBAg.